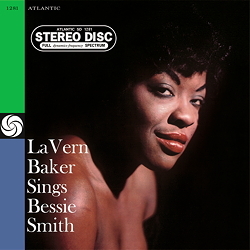 "LaVern Baker Sings Bessie Smith" - LaVern Baker (voc); Paul Quinichette (ts); Jerome Richardson (bs); Jimmy Cleveland, Urbie Green (tb); Buck Clayton (tp); Nat Pierce (p); Danny Barker (g); Wendell Marshall (b); Joe Marshall (dr); a.o. ﻿It was 1958 when a passably successful R&B singer entered the recording studio with an all-star band to tape a dozen songs from the global repertoire of a legendary blues vocalist. The old-fashioned style in LaVern Baker’s tribute to Bessie Smith might seem somewhat strange in the midst of popular R&B numbers and the growing productivity of the Motown hit machines, but it certainly found favour with the public. And for a very good reason too! Right from the very first number, "Gimme A Pigfoot", the snappy bass line conjures up the ballroom atmosphere of the Twenties. A bluesy dialogue with the trumpet ("Baby Doll", "I Ain’t Gonna Play No Second Fiddle"), alternating with robustly orchestrated swing rhythms ("On Revival Day"), and time and again cool, faltering blues ("Black Water Blues") guarantee great listening and entertainment. The great names in the band read like a Who Is Who of outstanding musicians – Nat Pierce, Buck Clayton, Paul Quinichette, Urbie Green and Jimmy Cleveland, all who crown the fantastic sound of their performance with relaxed and easy-going solos and finely balanced background playing that would hardly be more authentic on a live stage. And by the way, fans of traditional big-band swing will love this album too.